Here’s a great exercise for sciatica, or pain due due to nerve tension or even muscle/fascial tension throughout the leg. 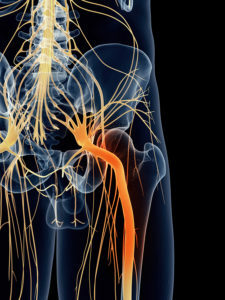 It’s known as “nerve flossing.” What we’re doing is actually mobilizing, or flossing the nerve structures so that they can more easily move or glide through the connective tissues, muscles and bony openings. This exercise should be completely comfortable if done correctly – you should not feel any symptoms at all. It’s pretty boring because it doesn’t feel like anything is happening if done correctly. If you start to feel more pain, tingling or numbness, then stop. Also, this exercise should not be done first thing in the morning. It’s best to start mid to late morning at the earliest to minimize the risk of irritating the nerves. Keep in mind this is not always an appropriate exercise in all cases of sciatica. If the pain is acute due to a trauma, or there’s a lot of inflammation present, this exercise could actually make the pain worse. If in doubt, see a professional for proper evaluation and guidance. When done correctly and appropriately, this exercise can help to significantly relieve, and even help to prevent sciatic pain.